Let me preface this article by saying that I am by NO MEANS taking anything away from Pat Summitt, she is a wonderful coach, the type that only comes around once in a lifetime. She deserves all the credit for all of the success that she has had. That being said, even though she has as many National Championships as a coach as the University of Kentucky has as a school, I still don’t care. It is women’s basketball, and it doesn’t excite me. I cannot name one player outside of Diana Taurasi or Shamika Holdslaw and I don’t think they play college basketball anymore. Furthermore, there are a few teams that are good year in and year out and the rest of the competition pales in comparison. These teams mainly being Tennessee and Connecticut, with another random BCS Conference school thrown in here or there. 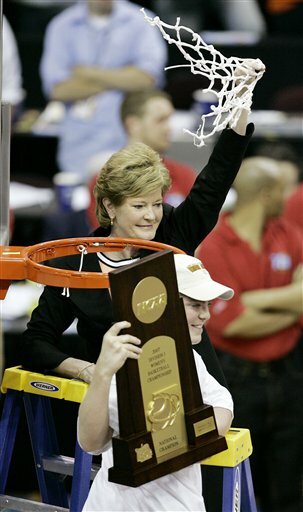 It may be seem like an amazing feat, for Summitt to win seven, but it really isn’t. There isn’t enough talent or parity to go around and the same teams will always win, and the more they win the more these teams will draw all of the talent and continue to win. It is like NCAA Men’s Lacrosse, does anybody care about men’s collegiate lacrosse outside of a few prostitutes in the Duke University area? I didn’t think so. Just like none of us can name any female basketball players, we can’t name any men’s lacrosse players either. Why did I bring up men’s lacrosse, you ask? Well, one of Virginia, John Hopkins, Syracuse, Princeton, or North Carolina has won the NCAA Men’s Lacrosse National Championship for the past 29 seasons dating back to 1978. Just as either Tennessee or Connecticut has won the NCAA Women’s Basketball National Championship 9 of the last 12 times. It just isn’t impressive if it comes down to the same two teams every season. It makes me wonder why we even have seasons for these sports. Why not cut to the chase and let Tennessee play Connecticut, best of three, and whoever wins is the National Champion for the next calendar year and we can all get back to something more important, such as Cheers reruns on TV Land. This entry was posted on April 4, 2007 at 10:51 PM	and is filed under NCAA Basketball. Tagged: AUTHOR:MJ. You can follow any responses to this entry through the RSS 2.0 feed. Both comments and pings are currently closed. Thank every one for this highlight about coach Pat, by the way I live in sulaymany (a city in north of Iraq) and a few months ago we had a camp for girls (53 girls for BASKETBALL.